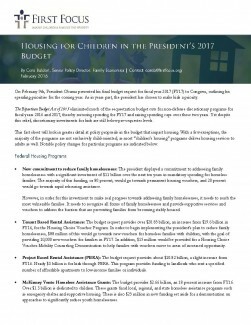 On February 9th, President Obama presented his final budget request for fiscal year 2017 (FY17) to Congress, outlining his spending priorities for the coming year. As in years past, the president has chosen to make kids a priority. The Bipartisan Budget Act of 2015 eliminated much of the sequestration budget cuts for non-defense discretionary programs for fiscal years 2016 and 2017, thereby restoring spending for FY17 and raising spending caps over these two years. Yet despite this relief, discretionary investments for kids are still below pre-sequester levels. This fact sheet will look in greater detail at policy proposals in the budget that impact housing.